The splake's numbers dwindled and their colors faded late month, but my son did get this guy after Thanksgiving. The photos never seem to catch all the color. 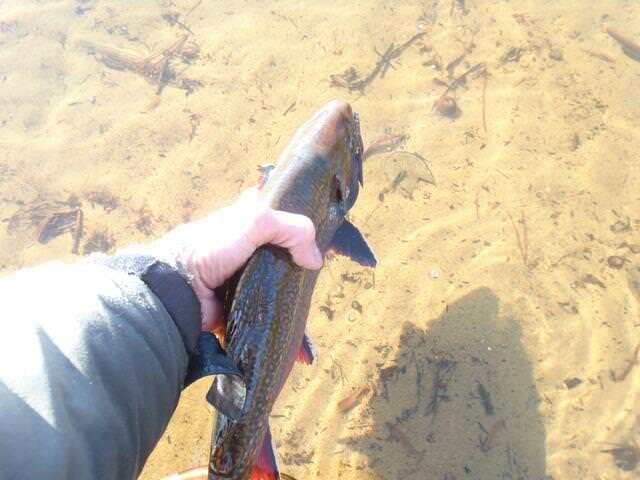 Late month and early December so far, it's been about the brookies. Mostly sight fishing in the shallows, with the evening bite being replaced by the best action at mid-day. As the water temps dropped into the 30's, crankbaits, streamers, and egg patterns have fallen out of favor. Small nymphs have proven to trigger fish in the ice water around the skim ice. Cold weather appears to be ready to settle in. I'll see if I can keep my open water streak going in the challenging 3 months ahead. awesome Jim, you're right about the cold weather coming up, night temps in the 'teens aren't far away, I'm not happy about it! Looks like we have one more week or so from now of good fishing than things are going to get tough. I'm gonna make the most of it. 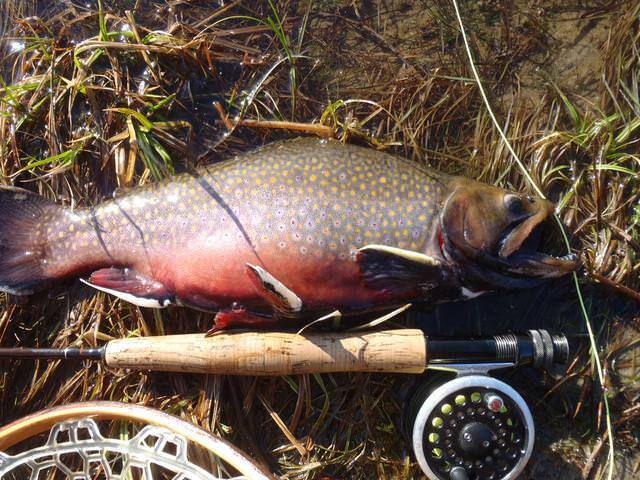 Great pictures, Like the brookie & fly rod pic especially. Is that a caddis larva nymph you have there in the last picture? can't tell. It is the overall fly pattern you mention, but tied with a lot of tinsel. Those are some beautiful fish, Jim. Good job and thanks for sharing. You've had another banner year Jim. You certainly had a variety of species and covered a lot of territory, even leaving the state a few times. I enjoyed your great camera work. Save a date this winter for a smelt trip to my tidal shack. Pay Cash Today, And I Will Trust Tomorrow. Nice post. Good luck keeping the streak alive. Precision Angling on Youtube. Maine based fishing. Some more great fish Jim. Nice work!! Precision Angling on Youtube. 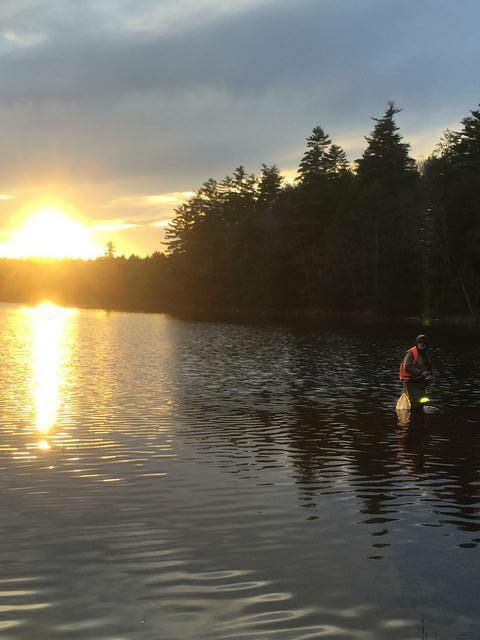 Maine based bass, pike, fly fishing, brook fishing, trolling and ice fishing. Hope to see you on the water somewhere!! When Can We Go Again!!!!!! Jim, Way to keep the open water season going. I hope to see more of your beautiful fish before the freeze up. Awesome! I always wondered since splake are not sterile if there is any worry about backcrossing with native brook trout? Nice fish Jim. I think we fished the same spot a time or two late last month. I believe the biologists here consider the splake to be sterile. 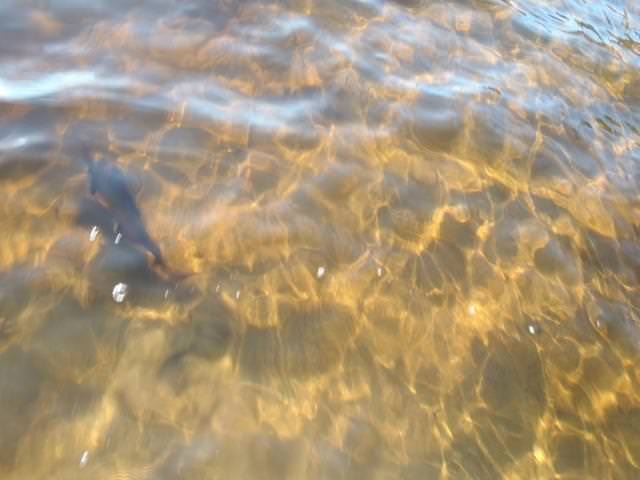 I've always been curious though because the Great Lakes seem to have reproducing splake in Copper Harbor and other spots.